The underwater environment is a dark and murky place where animals must rely on their hearing in order to survive. Many toothed whale (odontocete) species are highly vocal and use a complex variety of calls to communicate with one another. They also employ echolocation to distinguish underwater objects and hone in on their prey. By this complex system of echolocation, toothed whales can determine size, shape, speed, distance, and even some of the internal structure of objects in the water. Beluga whales in particular are especially adapted for life underwater and exhibit fantastic examples of this strong dependence on sound. Belugas live in the northern latitudes and as such often find themselves in the dark much of the year and must also navigate underneath ice flows in search of air holes. Belugas are extremely vocal and the frequency and large repertoire of their vocalizations has earned them the nickname “sea canaries.” In fact, the overstated “melon” found at the front of a beluga’s head acts as an acoustical lens to focus these sound waves into a beam which is projected forward into the water in front of the whale. Furthermore, when a beluga produces a noise, the melon also changes shape. It’s old news that odontocetes have specialized fats associated with their jaws allowing them to efficiently convey sound waves from the water to their ears, but until recently, the hearing system of toothless baleen whales (mysticetes) has remained a mystery. Scientists know they emit long, low frequency sounds which can travel miles and miles across the ocean, but it was speculated that mysticetes did not evolve sophisticated auditory systems because they graze on plankton and schooling fish rather than utilize echolocation to find prey. Baleen whales do not have enlarged canals in their jaws for specialized fats (like odontocetes) or a prominent melon, but a new study published by researchers at Woods Hole Oceanographic Institution has revealed that minke whales also have fats leading to their ears! This could potentially mean that the fats in both types of whales may share a common evolutionary origin. Studies on baleen whales are tricky because specimens are hard to get. Unlike toothed whales, they are large, not kept in captivity, rarely strand on beaches and decompose quickly when they do. For the Woods Hole project, lead author Maya Yamato received seven heads of minke whales that had stranded on beaches near Cape Cod. The heads were scanned using computerized tomography (CT) and magnetic resonance imaging (MRI) to generate a 3D image of the whales’ internal anatomy with the bones and soft tissue intact and in their undisturbed natural positions. This provided an unprecedented look at their internal anatomy. The whale heads were dissected and together with the imaging showed that the minkes had a “large, well-formed fat body” connecting to the ears, providing a potential transmission pathway guiding sound from the environment to their inner ears”. 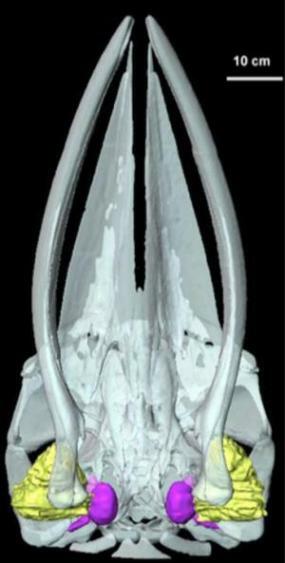 This is the first successful study of baleen whale head anatomy using cutting edge imaging techniques and has provided an important addition to the understanding of mysticete auditory systems. View the complete article here. Have you spotted a minke whale lately? They are rather elusive on our coast but can be found year-round. Minkes are the smallest baleen whale here in BC and can be identified by a large, curved dorsal fin and white bands on their pectoral flippers. 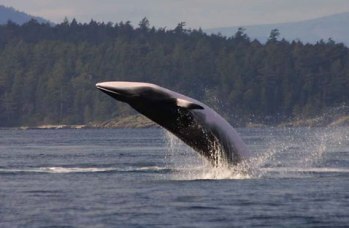 To learn more about minke whales, check out our page. To report your whale, dolphin or porpoise sighting, click here. 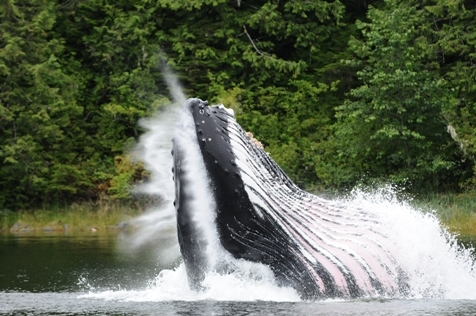 A humpback whale lunge feeds in Shearwater, BC. Image of a minke whale skull. The fats (shown in yellow) associated with the ears (shown in purple) may transmit sound waves from the water to the ears inside the whales' head.